In collaboration with the Western Health and Social Care Trust, the Tyndall National Institute in Cork, researchers at the the University of Ulster and C-TRIC are developing a bespoke 'data glove' fitted with sensitive movement sensors which use advanced software developed by the School of Computing and Intelligent Systems at the University of Ulster's Magee Campus. This pioneering project, funded by the Science Foundation with support from C-TRIC's Bio-Entrepreneur Programme and the DEL PhD fund, could minimise the time needed for consultation of patients with rheumatoid arthritis. This in turn would improve the accuracy of diagnosis and treatment for the patient with the potential to make huge savings for the health service. Rheumatoid arthritis is a disabling and painful condition which limits movement in the finger, wrist, knee and elbow joints. It is estimated that around 400,000 adults in the UK suffer from the disease and approximately 20,000 new cases are diagnosed each year. Apart from the huge personal cost, rheumatoid arthritis has serious economic implications as one in seven patients give up work within 12 months of diagnosis and four out of every ten people with rheumatoid arthritis lose their jobs within five years, the majority for reasons directly related to their condition. University of Ulster academics Dr Kevin Curran and Dr Joan Condell alongside PhD researcher James Connolly and Western Trust's rheumatoid arthritis consultant Dr Philip Gardiner explain that hand measurement is used for diagnosis, prognosis and recovery assessment of patients with arthritic conditions specific to the hand. Dr Curran said "If patients are to receive the care needed to manage their condition and doctors the time to assess their condition thoroughly, more accurate and less laborious methods to record joint movements are needed. Measurement of joint range is used to establish a baseline and to record progress but this requires exhaustive personal examination and can be very labour intensive. Current measurement techniques are either invasive like X rays or have an over reliance on manual evaluation, such as vision and touch, both of which are very dependent on training and experience and results can vary widely between observers." James Connolly continues: "Data gloves have been used before to measure joint movements but they were not fitted with sufficient sensors on each finger and deformities and swollen joints caused the sensors to record inaccurate readings. "The bespoke glove we are developing with Tyndall will give more precise and detailed readings." The Tyndall data glove - which is a much more advanced version of anything currently available to clinicians - will be able to integrate real time movements of the hand to allow detailed observations and measurement of each patients' hand and wrist movements. It will include pressure rotation sensors on the thumb, single pressure sensors on each fingertip and bend sensors on the finger joints. Dr Condell adds "Patients will be able to wear the glove at home and this would allow joint stiffness to be dynamically monitored so the rate of movement of joints at different times of the day can be measured offline from the clinic. This will help quantify and better understand 'early morning stiffness' which is almost universal in patients with inflammatory arthritis. "The system will also be able provide a live 3D stimulation model of joint movement programmed with finger exercises to help with rehabilitation which will assist clinicians assess the quantifiable benefits of the exercise programme." Although the data glove is being developed with rheumatoid arthritis sufferers in mind, there are many other possible applications of a wearable sensor glove, for example rehabilitation of hand injuries, where accurate clinical measurements are essential. Dr Condell says the project could have significant commercial benefits in the electronic manufacturing sector as the 'wearable technologies' sector continues to grow. 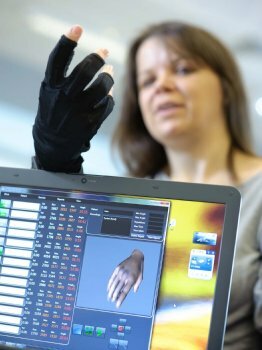 "The target market for the data glove is the medical devices industry and the global market for medical devices and consumables is estimated to be worth £150 billion, with the US accounting for 40% of the total global spend."